Two weeks since the last blog, this means you'll be getting a double dose of IpBoG goodness this week! 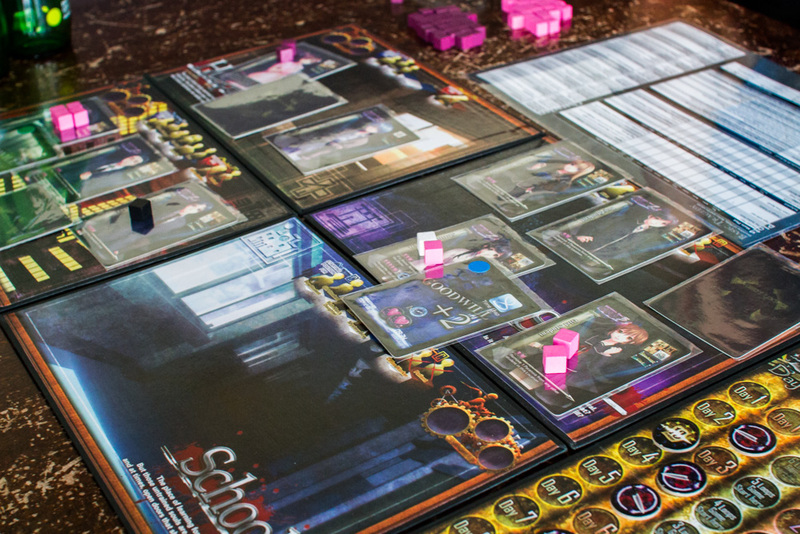 The weekend before last was the UK Games Expo and a few IpBoG regulars attended. Johnny and Danny had both picked up new games while they were there, both of which I think are by English designers. Johnny had picked up Frankenstein's Bodies and Danny had got Luchador! 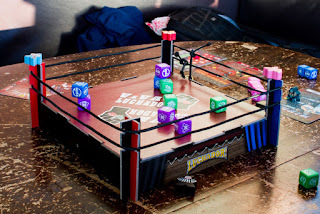 Mexican Wrestling Dice. I played Luchador while the others played Frankenstein's Bodies. 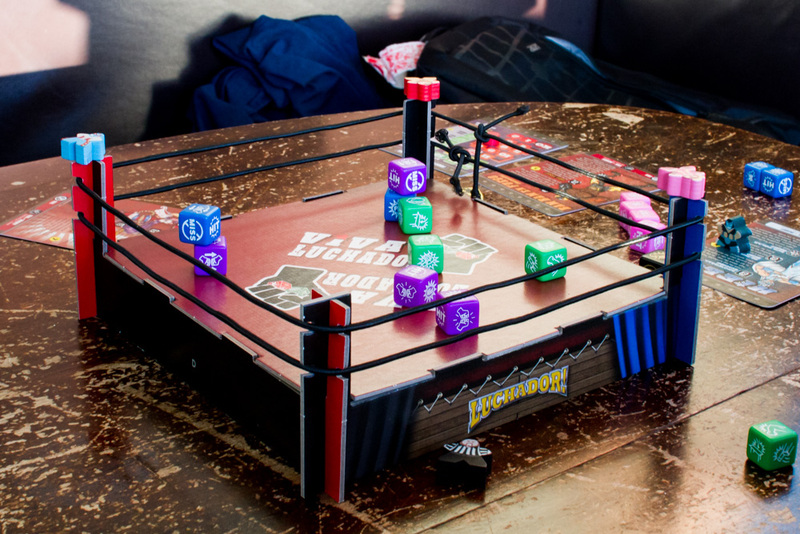 Luchador comes with the option of laying a flat two dimensional wrestling ring or a full IMAX 3D ring. Naturally we donned our 3D glasses and and played in the maximum number of dimensions the game would allow. Games last about ten minutes and I lost both games I played. The game is a kind of Yatzee style luck-fest. But a fun luck-fest never the less. Afterwards we played Modern Art. It's an auction game and a pretty pure one. It was Mike's game and he was the only one that had played before but towards the end of the game he'd hardly won any auctions. However, it turns out he knew exactly what he was doing. Everyone else had been vastly over valuing the items and Mike had wiped the floor with us. The others were knee deep in Lost Legacy. I'm not sure which one, I think Alex may have bought a new version. Or perhaps two new versions. So we played a few games of The Resistance. Some people said some things, some stuff happened. You know? The Resistance. Now on to the the next week. Danny had brought along Luchador and some more of that was played followed by Tragedy Looper. Danny was the bad guy as always but this time he was foiled in his evil deed. Danny had pimped Tragedy Looper since the last time it had appeared at IpBoG. The cardboard tokens had been replaced by wooden cubes imported from Germany. That's dedication! Mike once brought Taluva for me to play as he thought I'd like it. It turns out I did and wanted to get myself my own copy but it was pretty hard to get hold of. Well, I finally managed it and so brought my copy along. 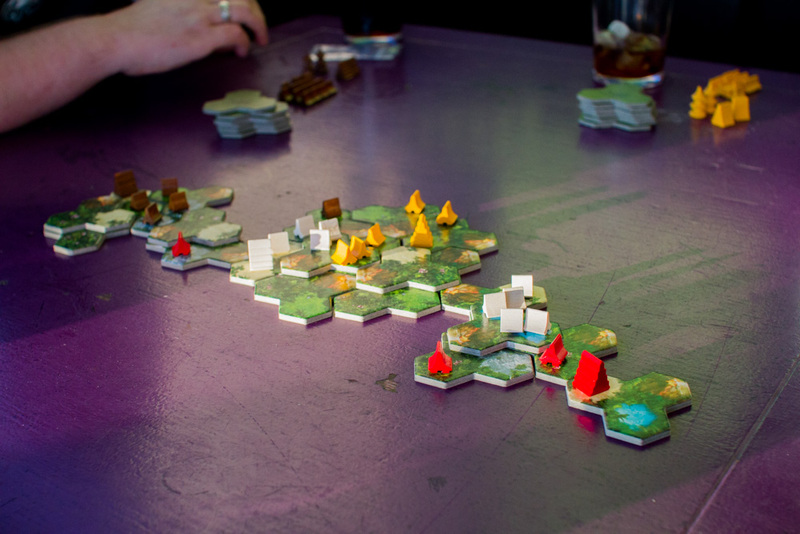 It almost feels like an abstract game although it's not abstract, it has a sort of island settlement building theme. It's so nice, we played it twice! The first time it was either going to be me or Alex to win and it was basically up to Dan. If he blocked me Alex would win but if he didn't I would win. He blocked me, thanks a lot Dan. In our second game it was getting to the last round of the game and it looked like Alex was going to win but on my final turn I managed to play all of two types of building which ends the game and is an instant win. We finished up the night with Blueprints which made its first appearance it IpBoG. It's a game where you build towers out of dice and Danny is actually some sort of real life architect. This must have helped in some way because he ended up winning by a mile.